It puzzles me why people buy these rims for daily riding. Light weight parts are a compromise with durability, period. If you ain't making your living off racing and needed the extra perceived edge new tech parts give, why bother risking injury and broken teeth? Hi from Sapin, this July my rear r-sys had a problem: the left last hub cober "opens", the wheel goes on but you could see the head of the spokes. I send it to mavic and they solved it and they changed the original carbon rims for the new trenzed carbon ones. 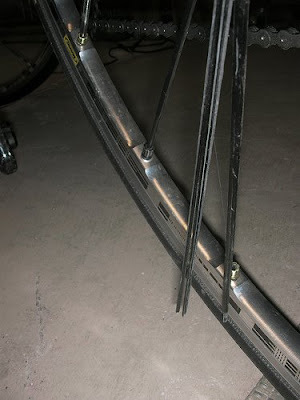 They know that the rear carbon spokes has the same problem as the front ones, but due to the aluminiun spokes, the wheel won't collapse so they know that it couldn't conduct to a fatal accident.